Hi, I’m Dr Ved Berani, Principle Dentist of the Healthy Smiles Dental Group. 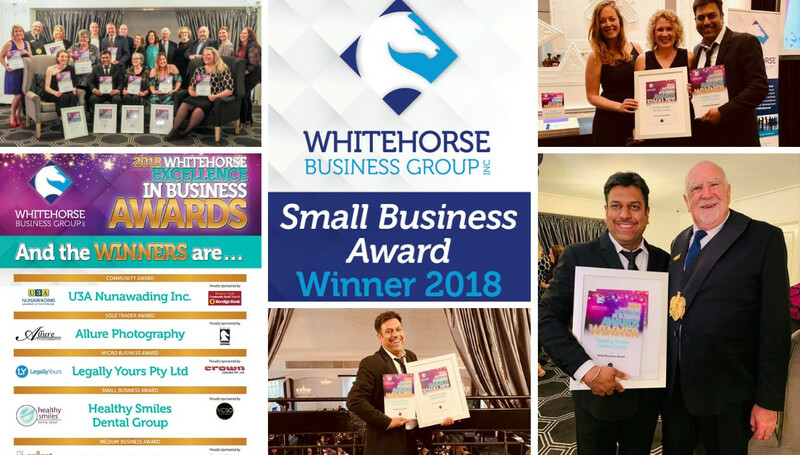 I’m very proud and honored to be receiving the Whitehorse Small Business Award for a small sized business with upto 20 employees. I believe that we are proud recipients of this award because we are a dental practice that operates with a difference. We believe that our patients are our bosses. We are in business because of our clients and we believe that their comfort, their care and their priorities are our business. As a dental practice, we provide all facets of dentistry under one roof, including but not limited to cosmetic dentistry, Invisalign, orthodontics, implants, wisdom teeth extraction and root canal treatments. But that is not what makes us different. The reason we have received this award today is because we believe that we should go above and beyond as a dental practice to make sure that our patients are well-cared for as a family. When we talk to our patients, we believe that they should have all the choices in regards to their dental treatment. We do not force or recommend any treatment to them, but instead, we give them all options, including the consequences, advantages and disadvantages of the treatments and let them choose the best way forward for themselves. When they make an informed decision, we as a dental practice support them. Often awards are received and forgotten quite easily. But for us, this award, is a reminder that everyday that we go to work, we have to strive for excellence. There is no second-best in a dental practice and every patient is the most important one. This philosophy has helped Healthy Smiles grow multifold in the last 15 years and today we serve over 15,000 patients every year with 6 dental practitioners. We are now looking to expand and double the size of the practice. We continue to offer unique treatments, like sleep dentistry, that makes us one of the very few practices in the eastern suburbs that offer a full range of sedation options for anxious and phobic patients. This commitment to providing sleep dentistry helps us stand out as a dental practice that believes that our patients should be dictating their treatments. Being a winner of the Small Business Award means that we will strive to be the best possible dental professionals and care-givers to our patients every day. To get the best treatment by award-winning dentist near Blackburn, book an appointment at Healthy Smiles Dental Clinic. « How to Choose a Reliable Dental Clinic in Australia?